It was a surging sea of heads from atop, pushing forward and crouching low in the downwash from the helicopter hovering over them. “Taratari koro, Modi eshe gechhe (Move fast, Modi’s here).” The crowd goes out of control—everyone in the tens of thousands gathered on a dusty ground and outside in Thakurnagar wants to see and hear Narendra Modi from close. And why not? They can’t recall when a prime minister came to address the Matuas before—though they are a tight-knit Hindu scheduled-caste community of more than 4.7 million and their votes can sway the outcome in about 74 assembly and seven parliamentary constituencies in West Bengal. The stats are not lost as Prime Minister Modi chose the Matua stronghold of Thakurnagar, 30 km from the India-Bangladesh border, to launch the BJP’s Lok Sabha election campaign in Ben­gal—a state where the party is looking for a putsch this summer to unseat its ent­renched bugbear, the Trinamool Cong­ress of Mamata Banerjee. In his speech, interrupted by appeals to the crowd to keep calm, he underscored his government’s citizenship amendment bill that will guarantee Indian nationa­lity to Hindus from Bangladesh. He tou­­ched a chord as the Matua community, which is also a religious sect that has matriarch Boroma at the helm, consists almost exc­lusively of Nama­shudra Dalit immigrants from East Bengal after Par­tition and Bangladesh after 1971. And many of them are said to be fighting for Indian citizenship. Modi, however, had to cut short his speech and leave as the crowd—more than double the ground’s capacity—breached the barricades. The BJP isn’t complaining, though. The turnout indicates the party has made inroads into the Matua community. In Thakurnagar, Modi prayed at the temple of Harichand Thakur, who founded the Matua Maha­sangha in East Bengal in the mid-1800s. It was Harichand’s grandson P.R. Tha­kur who established Thakurnagar as the sect’s headquarters after 1947. 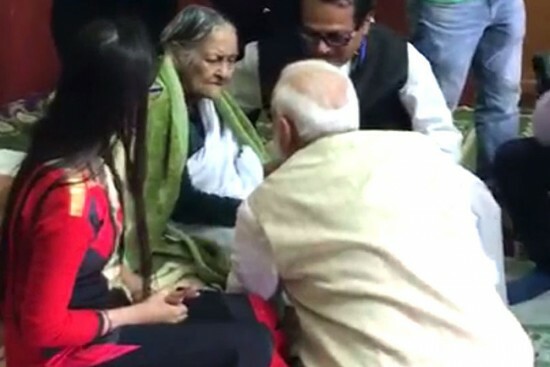 Modi also met Binapani Devi, or Bor­oma, who belongs to the Thakur family, and sou­ght her blessings. For their part, the Matuas are politically divided. They were initially behind the Congress and then with the Left from 1977 until Mamata wooed them away in the 2008 panchayat polls, when the Tri­namool tasted its first electoral success in the state. In the 2011 assembly polls, Mamata endorsed the Mahasangha—a key factor that ended the Left Front’s 34-year reign in the state. Boroma celebrated her 100th birthday last year in the presence of Mamata. One of her daughters-in-law, Mamata Thakur, is a Trinamool MP. One of her sons, Manjul Krishna Tha­kur, has been a minister in Mamata’s cabinet, but his sons are with the BJP. The youngest, Santanu Thakur, invited Modi to the Feb­ruary 2 rally. Citizenship is an issue that could make many Matuas lean towards the BJP. A sizeable chunk who came after Bangladesh was formed says the current cut-off date of March 25, 1971, for Indian citizenship doesn’t help because people were forced to leave the country years after its independence. Besides, the Mahasangha—the structured apex body of the sect—has been demanding post-Partition citizenship rights for every community member. The community, according to analysts, makes up more than a third of all Hindu immigrants from Bangladesh. But Mamata opposes the Centre’s bill—a point Modi didn’t forget to mention during his 17-minute speech in Thakurnagar. He asked the chief minister to end­orse the proposed legislation, which was passed in the Lok Sabha and pending clearance from the Rajya Sabha, where it was yet to be tabled. Mamata says the bill discriminates between immigrants on religious grounds. “The Centre will have to withdraw the citizenship bill and there is no question of supporting it. We will not let Modi succeed,” she told a Bengali news channel. Mamata knows all too well the influence of the Matuas and so, to keep the sect on her side, her government gave land rights to people living in 94 refugee colonies in the state irrespective of their faith last week. The Mahasangha, a powerful political bloc along the border belt, is one that every party in Bengal would want on its side, says senior journalist Subir Bhau­mik. “The Matuas vote as a block and are playing both the Trinamool and the BJP.” The BJP, which made noticeable inroads in the 2018 panchayat polls, is trying to woo the Matuas, especially in the districts bordering Bangladesh, poli­tical analyst Subharanjan Dasgupta says. The BJP’s tone, timing and content have set the stage for a battle that pro­mises a hard-fought outcome. Next Story : CBI-Kolkata Police Face-Off: Can Mamata Establish Herself As Leader Of Mahagathbandhan?